WILLEM-ALEXANDER, King of the Netherlands, noting that the United Nations had helped to halve global poverty and enable 2.3 billion people to gain access to drinking water, congratulated the Organization for the 70 years it had battled cynicism and fatalism. Indeed, it would remain the primary organization for peace, justice and development, which was why his country was a candidate for a non-permanent Security Council seat for the 2017-2018 term. At the same time, he said, it must look openly and honestly at the goals that had not been achieved. His Government was gravely concerned about the terror and contempt for human rights that were gaining ground in some areas. Refugees had been in a desperate situation for too long. “We cannot look the other way,” he said, urging all countries to show solidarity in the face of that crisis. 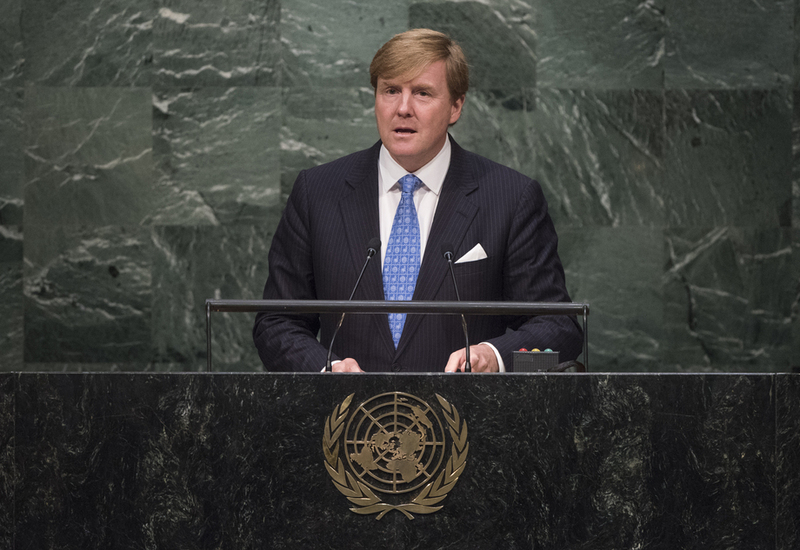 The Netherlands had increased its assistance, making it one of the largest donors, and he called on others to support the United Nations in that regard. On the security front, he said a combination of defence, development and diplomacy was needed to fight discrimination and exclusion. Recalling that the Netherlands was home to the International Court of Justice, he said his country, along with Malaysia and Australia, grieved for loved ones lost in the Malaysia Airlines flight MH17 disaster. They awaited results of Security Council resolution 2166 (2014), which demanded that those responsible be held to account. His Government would work until justice was done. It would also ensure the success of the Sustainable Development Goals, he said, stressing that there was not enough focus on the role women could play in that regard. Promoting equal rights and opportunities was “sustainable development in action”. Finally, the Security Council should act more boldly in the face of atrocities, he said, and restraint in veto use would help. Welcoming France’s initiative in that regard, he said Africa in particular was underrepresented in that body, as were other regions. “This needs to change,” he said. The Netherlands understood the importance of the plea by small islands for a more active approach to climate change and marine pollution. As one of the best-protected deltas in the world, investing billions to mitigate the effects of such phenomena, the Netherlands would make its voice heard at the upcoming Climate Change Conference.